Development is moving along swimmingly! 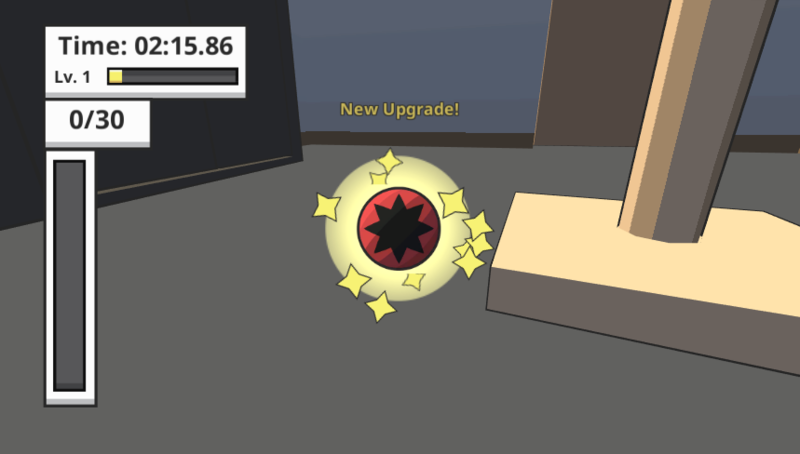 Procedural levels, leveling up with experience, random upgrades, and more! The game is also playable on Steam and OUYA in an early access state, with a full release scheduled for early next year. Lots of stuff has been going on during the past few months. I haven't posted much news here because I've been keeping busy with development, getting the game up on Steam and OUYA, and doing other indie-related work. In this update I want to talk about some of the new stuff that's been added to the game since the last update (like this fancy new title screen!). The build I showed off at PAX Prime & Boston FIG a few months ago was the last update to the free web demo of the game (you can still play it here) before focusing completely on the full version of the game. During that time I was finishing up the foundation for the procedural level generation system that will be building all houses and rooms from now on. (If you're interested in reading about how the game is generating levels, check out the design and implementation dev blog posts!) The system is now fully functional, though it needs some polishing up. Along with that system, I added procedural game objectives for each room, which is something that's actually in the web demo. On top of all that, there is experience/leveling up which awards you with randomized upgrades to help you make bigger and better messes. There's still a bit of work to be done but I feel like all these things will help keep the game interesting through multiple play sessions. Moving forward, there are a few big goals: make you feel more cat-like when playing, add a bunch of content (levels, objects, upgrades, etc. ), and just make the experience better overall. In the coming weeks I'm planning on polishing up the core gameplay mechanics first, then focusing on increasing the cat-ness level of the game, and adding more content as I go along. I mentioned before that the game is up on Steam and OUYA. That doesn't mean the game is finished though! The game is currently in a closed "early access" state where Kickstarter backers can play the game, provide feedback, and report any bugs they may find. You can still get early access to the game by slacker backing the Hipster Cat or LOLCat tiers on the game's homepage. Once you back one of those tiers you'll get a Steam key (Windows, Mac, & Linux) and an OUYA voucher for the game. And if you have an OUYA, you can purchase just the game from the Alphas/Betas category on the Discover page (you won't get any of the additional goodies of a slacker backer though). That's it for now. Don't forget to tune into my weekly development livestreams every Tuesday at 4PM Eastern Time to follow the game's progress. I also occasionally post on the dev blog, though I haven't been too good about that recently. And as always, thanks for liking, following, and playing the game!